Sold new to Swiss amateur racer Walter Ringgenberg, this 550 Spyder was entered at Le Mans in 1955. An engine issue ended the race early for the Swiss entry. The car was then entrusted to a young engineer named Michael May. He used to experiment with what was one of the first adaptions of a wing to generate downforce in motorsport. Mounted above the cockpit, the massive wing had to be tilted upwards to allow access to the car. 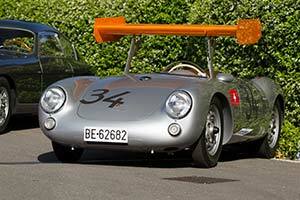 May found the wing to substantially improve the Porsche's cornering speeds. Late in 1955, he used the car to average 206.7 km/h for six hours at Montlhéry; a new world record. Ready to show his creation to the world, May entered the modified 550 Spyder for the 1956 Nürburgring 1000 km. The car proved a full four seconds faster in qualifying than the works Porsches. Rather than recognising the value of May's modifications, Porsche's team chief Huschke von Hanstein used his influence to have the wing banned from the race to ensure no further embarrassment for the works entries. The official reason for the ban was that the wing obscured the view of the drivers coming from behind. With the wing removed, the car had lost its edge and eventually retired with synchromesh issues. Although often overlooked by historians, May's efforts were eventually awarded with contracts at both Porsche and Ferrari. Michael May's Porsche survived and eventually ended up in Italy with the wing long removed. The current owner recognised his car's unique history and set about restoring the 550 to the configuration used to embarrass Porsche's works team at the Nürburgring in 1956. May himself inspected the car, fittingly in May of 2015, and confirmed that the wing was installed and functioned just like it had done almost 60 years earlier. The car has since been shown at the 2015 Pebble Beach Concours d'Elegance and the Concorso d'Eleganza Villa d'Este in 2016.